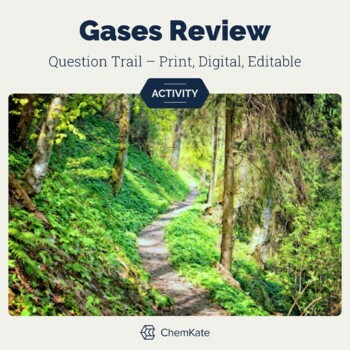 Engage your students and get them moving, collaborating, and practicing gas topics in an active way. This “Choose Your Own Adventure” review activity gives you the opportunity to give one-on-one help to those who need it and students the time to self- or group- monitor their work. 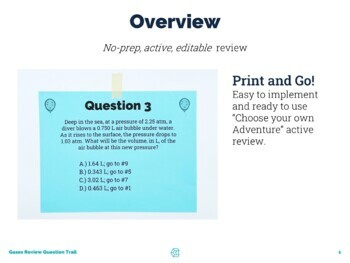 If you have never tried a question trail before, now is the time to try this interactive, collaborative, engaging review Print & Go! activity. Print & post these questions around your room. Students can begin at any question, working together to find the answer. Their multiple choice answer at each station will direct them to the next question. Students continue working around your room, collaborating, and blazing their trail through these questions. Making a full circuit through these question and ending where they begin means they have gotten them all correct. If they are find they repeat any station, it means they have made a mistake. They will need to backtrack to find their mistake. If they have troubles finding their way back onto the trail, they are then directed to ask you to help direct them back onto the correct trail once again. 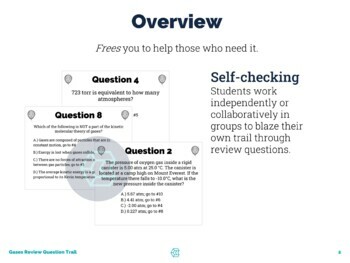 These question trails keep your students' brains active while they work, helping them identify their strengths and weaknesses and provides you the time to help students in smaller groups. ● Did you know that you can receive credit towards future TpT purchases by reviewing this product? Please help my store grow by leaving a review at the product page or through "My Purchases" under "My Account" at TpT. I enjoy making products to help you be successful in the classroom, so if you have any other questions or suggestions, please contact me in the "Ask a Question" tab above.